i. 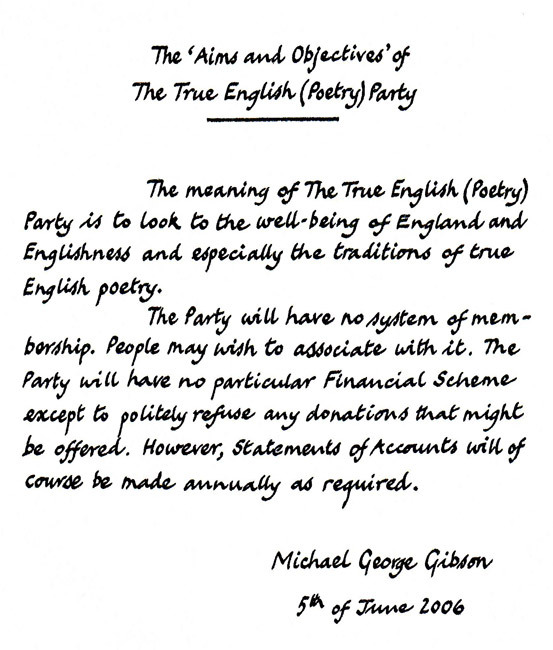 The True English (Poetry) Party has no politics or policies in the full sense. The Party bases itself as it were in an England seen to be the home of an English nation. The language which originated in the south of an island that also comprises the countries of Wales and Scotland is now of course widely spoken throughout the world. The Party is particularly concerned for the well-being of English poetry ~ and, indeed, of the English language ~ and of the land of England. The Party sees proper husbandry of the land (and, of course, of the sea and air) as a duty. We have a duty in common sense to cherish our soil and water resources and to grow as much as we can of our own food in a ‘sustainable’ way. 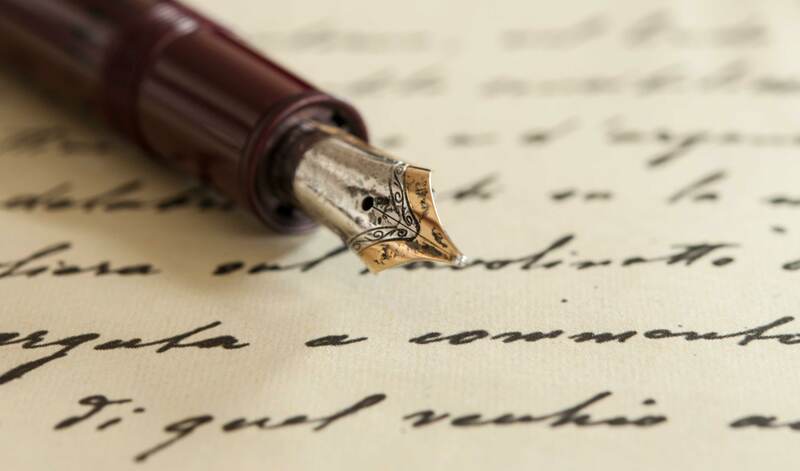 Regarding poetry, which is the Party’s field of particular expertise, we consider that we have a like duty to conserve and develop what is in some ways an important national and indeed international resource. 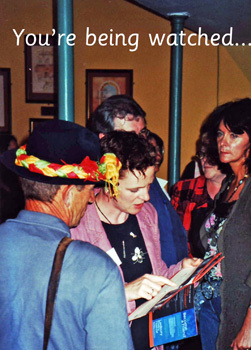 Poetry is rightly regarded as a valuable cultural component. It is good that we teach our children something about the best English poetry that has been made over the last 1,300 years and of the practices and techniques that produced it. We should also help children to see that poetry was and is a rhythmic form of writing or speaking that is different from other sorts of ‘word things’. Thus we need to be able to say clearly what poetry truly is. ii. Unfortunately, there is much muddle and confusion in this matter, and this is to be deplored. The ‘world’ of poetry is a curious one. Wonderful things may be found there; but there is also much silliness in the field of English ‘verse’. A Professor of Poetry in an English university may declare that English poetry does not begin until the time of Shakespeare. 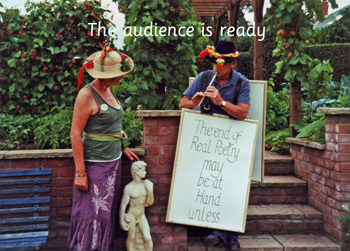 A ‘Chairperson’ of an organisation in England calling itself The Poetry Society cannot give a simple and reasonable definition of what ‘poetry’ and a ‘poem’ truly This organisation, which is in part publically funded, has close links with the country’s educational authorities. Someone may be made a Fellow of the Royal Society of Literature for work in the field of poetry who cannot give a simple and straightforward account of what poetry truly In an important book on poetry matters this Fellow shows considerable ignorance of English poetry and a basic ineptitude in the formal analysis of it. This person was a ‘Chairperson’ of the Poetry Society. Teachers in Primary Schools in this country are required to teach ‘poetry’ as part of the National Curriculum. These teachers are unlikely to be able to give any clear and simple account of what English poetry actually They are sensibly encouraged to introduce the ‘Limerick’ form as a type of poetry. Yet a Professor of Poetry in a British university who has received an O.B.E. for ‘services to poetry’ has declared on the BBC ‘Today’ programme that the ‘limerick’ is not poetry at all. Clearly, then, the ‘world’ of poetry is in some respects a somewhat silly and muddled one. iii. But does any of this matter to the world at large? Clear thinking is needed in all fields of human activity, and all fields of human activity are interrelated and connected. Insufficiently clear thinking would seem to be evident in many matters of global political concern. Muddled thought, and deception and self-deception, may endanger the well-being of us all. For instance, in the matter of ‘the 2nd Gulf War’ and the invasion of Iraq, muddle and nonsense have prevailed. Our Foreign Secretary of the day tells us that a) he thought that the plans for invasion were illegitimate, but b) he nevertheless voted to commit this country to war. In the matter of global climatic conditions, and resources for life; it is clear that there are dangerous changes occurring to which human industrial and technological development probably contribute, and that there will be increasing scarcity of resources. Yet there is no clear national or international statement of the fact that ‘there are too many human beings wanting too many of the “wrong” things’, and no clear resolve to address the problem. The simple sense that each of us should try to use less of the world’s finite resources (and perhaps enjoy the process) has not yet taken real hold and is not firmly enough encouraged. 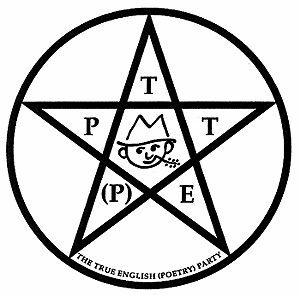 The True English (Poetry) Party seeks to promote good sense and clarity with regard to the matter of poetry in particular, as a contribution to good sense in all matters generally. In the arms of some ‘Westminster Dad’. Let’s get off, walk and talk the next mile. The assertions made in part II of this Manifesto are widened and supported in papers presented on this website. 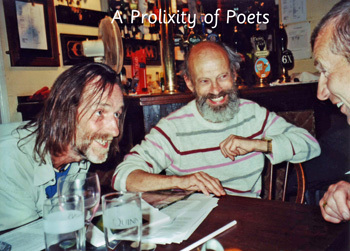 A preliminary attempt to give an answer to the question ‘What is poetry?’ is appended. Its most important foundation document is this paper. a kind of poetry that does not conform to any regular meter: the length of its lines are irregular, as is its use of rhyme – if any. at the comfortable Orchard Cottage base. But had the machine perhaps been commandeered by our opponents? 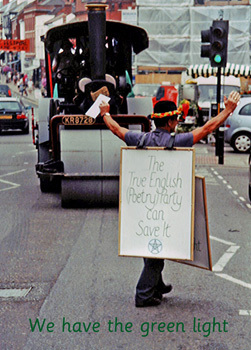 Mr. Tony Walton and Mr. Roy Lee Sadler later dispute the definition of ‘true poetry’ offered by Mr. Gibson. *In an article the next month in The Guardian, Ms. Padel falsely claimed that she had been heckled. This matter has now been taken up here.